Sunset Beach is a small beach town of just over 2,200 people on the southern end of North Carolina. It is just north of Myrtle Beach and south of Wilmington. The beaches in this town are the main draw, offering warm water and a real ocean experience. 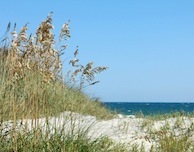 Other nearby towns on this site worth checking out include Ocean Isle Beach and Southport. A high-arc bridge replaced a pontoon bridge in 2010, which improved access to the beach.